The restaurant draws big crowds for its upscale, Hong Kong-style dim sum. The piggy buns are filled with a light, creamy custard. 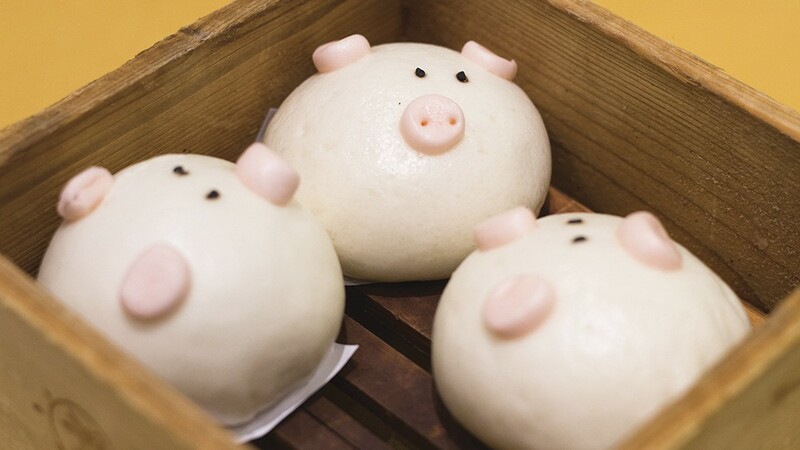 The first dish hit the table: Three steamed buns wearing pale pink snouts, matching ears, and black eyes the size of sesame seeds. Three little piggies — so cute you might be tempted to tickle one. Cuteness is all over the menu at Fusion Delight, the one-year-old San Leandro restaurant that's become one of the most popular dim sum destinations in the East Bay. Waits for a table on the weekend frequently top an hour. Before the piggies arrive, though, what's immediately striking about Fusion Delight is how much it feels like a Hong Kong dim sum house. There's the grand entrance, punctuated by a glass art installation that looks like gleaming, white flower petals suspended mid-air. Inside the enormous, 328-person dining room, plush purple chairs flank gold tablecloths. The fish tank glows. The chopsticks are branded. And just about everyone in the restaurant speaks rapid Cantonese. The menu reflects current trends, too. While you can certainly still find classic dim sum houses in Hong Kong, the newest and buzziest establishments churn out sausage buns that look like wiener dogs, fish balls transformed into penguins, and bird-shaped pineapple dumplings served in an elegant cage. There are restaurants dedicated to Sanrio characters such as Hello Kitty and Gudetama. (At the Gudetama-themed restaurant, a bao depicting the lazy egg character even barfs up yellow custard when you squeeze its stomach.) It'd be tempting to say it's a trend driven purely by Instagram, but Hong Kongers' obsession with cuteness isn't new. It merely follows in the footsteps — presumably adorable, anthropomorphic, blushing, and giggling footsteps — of Taiwan and Japan. In Japan, kawaii refers specifically to this culture of cuteness that emerged in the 1970s. And Fusion Delight is just one in a fleet of local dim sum restaurants that have taken this cute cue from Hong Kong. In San Francisco, Dragon Beaux dyes its soup dumplings in vivid shades of red, green, and yellow, and Hong Kong Lounge's shrimp dumplings resemble little bunnies. In Oakland, the new owners of Peony serve steamed buns dressed up like teapots. At Fusion Delight, the adorableness avoids feeling too gimmicky. Sure, the pudding is served in a pot and covered with chocolate "dirt," as a single mint sprig pretends to be an emerging plant. But other creations show innovation. Thanks to a desire to add color and Instagramability to its menu, Fusion Delight also happens to be more vegetarian-friendly than other East Bay dim sum restaurants — certainly, almost everything still contains pork or shrimp, but there are a few compelling options. One is a steamed, mushroom-filled bun shaped, charmingly, like a mushroom. There's a tiny little stem poking out and, more impressively, a cracked, gritty pattern painted on top. The savory mix of shrooms inside was such an ideal substitute for meat that I continue to wonder why more restaurants don't make them. There are also bright-orange, deep-fried pumpkin balls, crispy and gooey thanks to glutinous rice flour. Despite the textural fun, they were a bit bland — I wished the chefs delivered more pumpkin flavor or went more assertively into salty or sweet directions. Better were the purple yam balls, a spin on the classic sesame balls filled with red bean paste. They had a similar, mochi-like consistency, but with a crunchier exterior and two fillings: mashed purple sweet potato and sweet-salty, duck egg yolk custard. They were as striking in their deliciousness as they were in their vivid coloring. 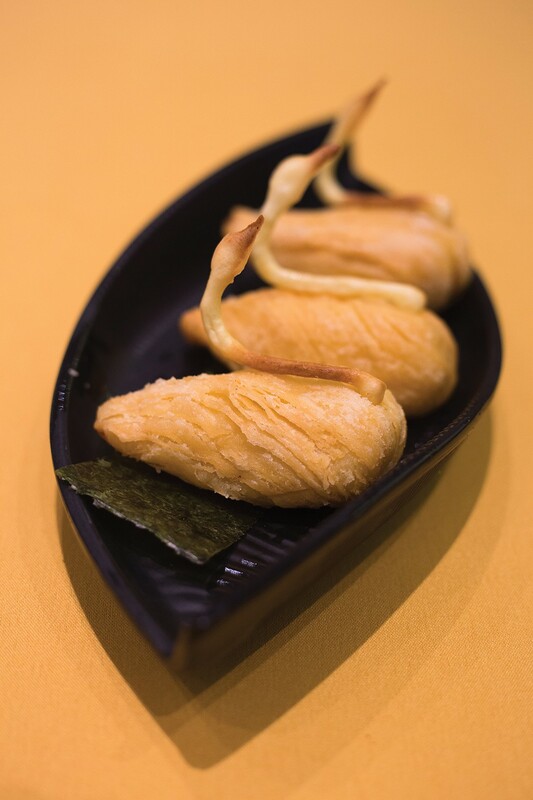 Durian fans will love the crisp, buttery durian puffs, shaped like regal swans and stuffed with the pungent, creamy fruit. Many of the dishes I tried at Fusion Delight were firsts for me. While the restaurant serves the usual assortment of cheong fun, it also offers a version starring pink rice noodles stuffed with fried shrimp and drizzled with peanut sauce. Dipped in a side of soy sauce, it was chewy, soft, and crispy — and sweet, salty, and savory — all at once. There's har gow, the classic shrimp dumpling, but there's also fried har gow showered with fried garlic and togarashi. Shreds of pickled ginger added extra zing to an already extremely flavorful dish — an extra surprising treat given har gow's typical mildness. Without fanciful extras to hide behind, the more straightforward items were more hit or miss. I tried a few different pork buns — there are far more variations than I could hope to try in two sittings — including shen jian bao, the small pan-fried versions prepared in the Shanghai style. I appreciated the crispy, sesame seed-crusted bottoms, and soup squirted out as it should, but they were a little doughy. The flatter pork buns served in a clay pot suffered from similar, overly doughy proportions. The baked, crispy-topped barbecued pork bun, crowned with what's often called a snow cap, was tasty but sweeter than most of the restaurant's desserts. If I'm nitpicking, the regular har gow wrapping felt slightly too loose. But the siu mai, the classic pork-and-shrimp dumpling, was plump and juicy; the ham sui gok felt clean and perfectly chewy; and I loved the delicate dumplings filled with dried scallops and pea shoots, which tasted like spring. For dessert, Fusion Delight keeps up with Hong Kong trends by serving coconut-osmanthus jelly, which looks gorgeous in pristine layers and studded with flowers. Osmanthus is popular in Hong Kong for its perceived health benefits, but its flavor is extremely mild, so I wished the taste of coconut was stronger. Still, it looked lovely, served on nice, black ceramic plates, primed for Instagram, which is maybe the whole point anyway, right? Given the sheer size of Fusion Delight, it should be no surprise that the service leaves something to be desired. That said, I faced no serious issues. Desserts came before savory dishes. Staff members didn't speak much English, but the menu offers decent translations and photos. And, of course, you'll want to follow the usual unwritten dim sum rules, like flagging down someone in uniform — really, anyone — to take your order and removing the lid of your teapot when you want more hot water. Durian fruit is baked into buttery, swan-shaped pastries. When you arrive, there will probably be a crowd of people waiting out in front. Elbow your way to the front, tell the hostess how many people are in your party, grab a ticket, and wait for your number to flash on the flat screen in the waiting room. It's an efficient, easy-to-follow system. I also appreciate that, as with other top dim sum restaurants in the East Bay, you order off a menu instead of wait for carts to roll your way. That ensures hotter, fresher dishes. To avoid waiting for a table on a Saturday or Sunday, you'll want to get there before 10 a.m. Hours: Mon.–Thu. 10 a.m.–3 p.m., 5 p.m.–9:30 p.m.; Fri. 10 a.m.–3 p.m., 5 p.m.–10 p.m.; Sat.–Sun. 9:30 a.m.–3 p.m., 5 p.m.–10 p.m.